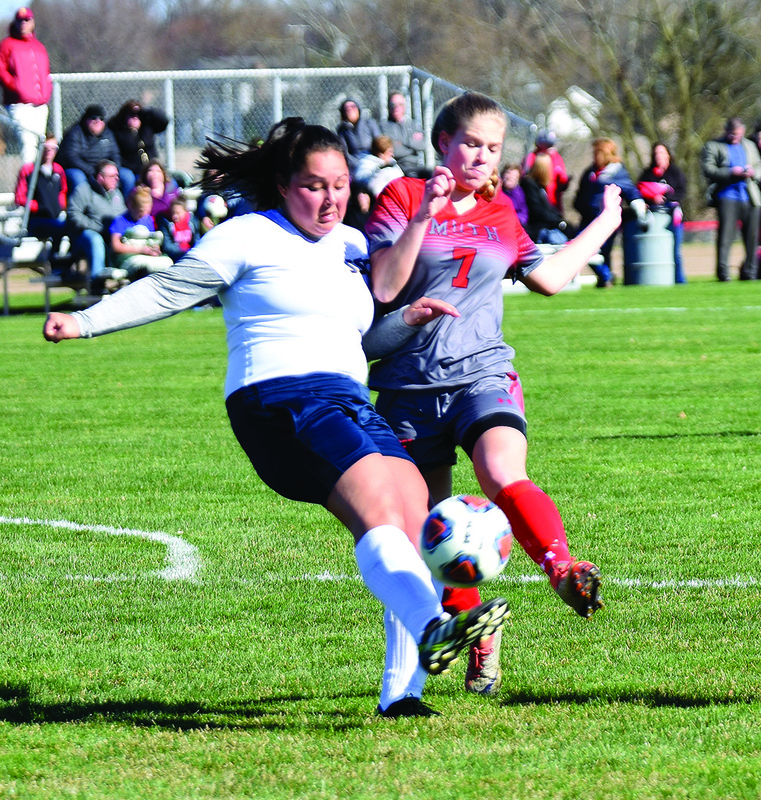 The Frankenmuth High School varisty girls’ soccer team traveled to Nouvel Catholic Central on April 9 to take on a young but skilled Panther team. There was one goal that came in the game, and unfortunately for the Eagles, it was by Nouvel. Frankenmuth had a few excellent scoring opportunities in the first half of play, however, they could not convert them into goals. In the second half, Nouvel controlled the majority of possession, and midway through the half they created the one and only goal of the game. The Eagles will be working hard to create a possessive approach to their attack to try to pick up their first goal of the season and a very needed first victory. The Lady Eagles hosted Standish Sterling on Thursday, April 15 and secured their first win of the season with a final score of 9-1. Frankenmuth used multiple players and multiple methods to score their nine goals in this home opener for the 2019 season. The Eagles had the Panthers pressed into their half of the field for a majority of the game, however Standish Sterling had two challenging attackers that were capable of creating serious trouble for the Eagles. Courtney Keyes had an excellent game and scored the first and last goals of the game with well-placed shots into the corners of the goal. Keyes had three goals in the game and had two assists which made her involved in five of the nine goals in the game. Baylee Stainforth also had a hat trick with three quality goals of her own. Her shots were well placed into upper and lower corners of the goal, and she was very controlled with her quick release of her shots. Stainforth also had an assist in the second half and finished with a very solid game. Maura Lee had an excellent offensive game as she scored two quality goals in the first half of play. The remaining score was from Alaina Soulliere, with a great run to beat a defender and the keeper. Soulliere assisted on two goals and was instrumental in creating a number of Frankenmuth's scoring opportunities. Margo Samson and Nissia Bernard both added an assist to complete an excellent day of scoring. I was extremely pleased that we used great individual efforts as well as precise combination plays to create our scores. This was the type of game that we needed to get our attack going this season. As impressive as our offense was this game, I was equally impressed on the excellent defensive play of the team. The Panthers had one forward that was extremely fast and dangerous, and Sydney Merrihew and Danielle Rummel did an outstanding job of containing this player. The patience and strength of both of these players was awesome. This is the type of play that will allow the Eagles to win those tough highly competitive games in our conference play. Frankenmuth will host Millington on Thursday, April 18 to kick off the TVC East conference play. We're glad you took the time to check out the abbreviated version of our paper. To read more, you can find The Frankenmuth News at local news stands or click on the "subscribe" tab.